Beer, Wine, Liquor, Spirits, Cocktails...Open Bar. Discuss, Recommend, etc. Re: Beer, Wine, Liquor, Spirits, Cocktails...Open Bar. Discuss, Recommend, etc. Ah, that's there 1958-62 cap if I recall. I like that one. 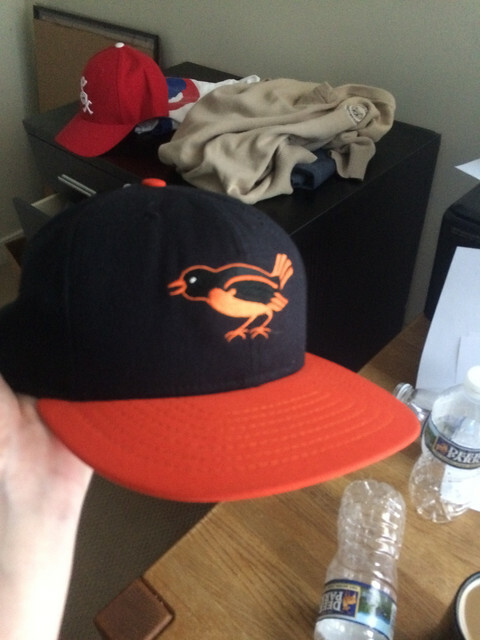 I have an all black one with that bird (1954) that I got as a giveaway during their 60th anniversary season a few years ago. Yeah mine’s a 1990s Roman Pro with a leather sweatband and not a flatbrim. I had one of those with the leather sweatband, but it had a different bird. I love wine. Blackberry, to be exact. My drink of choice though used to be vodka straight from the bottle. Funny part is I rarely drank as it was but when I did, it was like water. Just didn’t affect me as much as others. Bad genes I guess. That's kind of why I rarely drink. I usually only drink on holidays or some kind of party. I have a fairly long line of drinkers in my family, and with being as big of a music can as I am, I know a fair amount about addiction and genetic predisposition. Same here. I used to drink a lot while younger, but thankfully came to my senses before becoming a full fledged alcoholic. I rarely drink now. We have a tradition of going to the Smoky Mountains in the Fall and buying a couple bottles of BlackBerry wine at a Gatlinburg winery. I like to drink a glass after Thanksgiving dinner. I bet you regret being stupid like that when you were young. I figured you didn't drink at all whilst touring various countries, performing in choir etc. Didn't you fear being fired? Do they employ people like the kind you were, drinking much? Doesn't make sense. Been strict teetotaler since arriving to the planet Earth. Top that, ha. To be completely honest and blunt, I could see myself becoming an alcoholic easily, which is why I mainly drink in holidays. Been there, done that. But no way would I give it up entirely. And how can you drink someone's health with lemonade? Or, god forbid, ice tea? Wow. Just now reading RRs post from last year. For the record, I stopped excessive drinking well before I joined the folk group I was in for 20 years. I wasn’t a teetotaler then. Would have one glass of strong apple cider in Normandy, or one wonderful small stein of beer in the Czech Republic. Skipped the vodka in Russia however. I'm glad my forays into old threads can yield positive results.